Searching for answers to make the unknown known by exploring the Supernatural, Paranormal & Metaphysical. Conquering fear with answers, we enlighten the darkness. 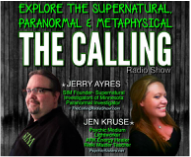 CLIENTS - Jen brings many unique abilities together to provide a wide array of expertise and decades of experience clients can trust in life, love, career, spiritual & personal growth, and, of course, in all things paranormal.